The portable, high-performance and energy-efficient VLF test systems are used for testing cables with 0.1 Hz cosine-rectangular voltage according to IEC/IEEE/CENELEC standards. In accordance with guidelines, the dielectric strength of cables and joints must be checked after installation or repair. 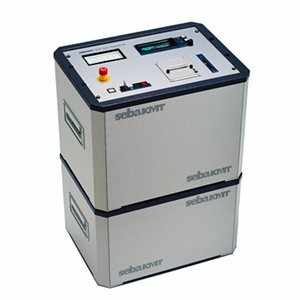 The VLF test systems from SebaKMT have high test-capacities and are still compact, because of the patented voltage wave-shape and the power-recycling during polarity reversal. Aside from cable and sheath testing, the test systems can also be used for the precise pinpointing of sheath faults (in combination with a step-voltage probe).